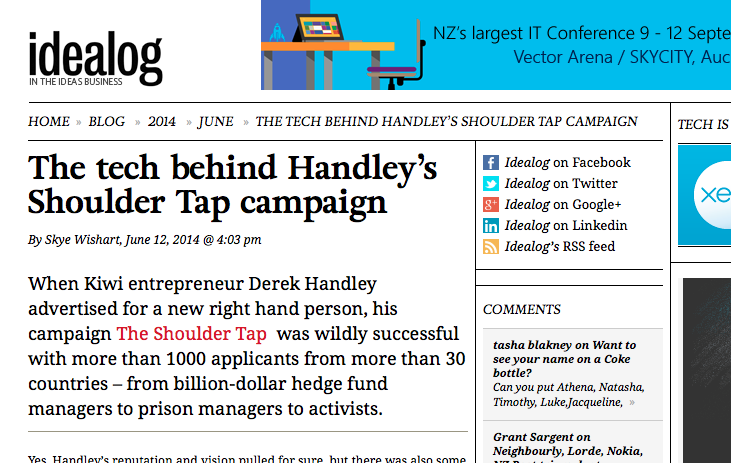 We’ve just been profiled on the Idealog website as the software behind Derek Handley’s #theshouldertap campaign. It’s a little win, but we’ll take it. When Derek approached us with the vision to build a unique recruitment campaign, we were keen as. Derek’s passion for innovative, forward-thinking and his dedication to supporting and helping drive Kiwi entrepreneurship is well known. Helping in the hunt for a person/people to share those values and realise his vision was right up our ally. Working alongside Hustle&Bustle, Augusto and Julie Landry, we’ve created a custom campaign site on the Weirdly platform asking people to recommend great potential candidates. They can either do this via the official Shoulder Tap site, or by tweeting with the hashtag #theshouldertap. In true Derek-style, this recruitment campaign stretches well beyond finding someone to fill a job. Along with asking people to design their own job descriptions and remuneration packages, he’s looking to create a socially-conscious community from the top 100 candidates. These guys will be smart, high-performing professionals at the top of their game – the up-and-coming leaders of industry. But they’ll also have unique talents, perspectives and skills that make them a bit different from the pack. The little weird things that shift them from great employees, to future leaders. #theshouldertap community will provide a place for those talented future leaders to share ideas that address some of the big issues facing New Zealand today. That sounds like a group of weirdos we’re keen to know.